You made the Earth as You desired, You alone. With people, cattle, and all creatures. and all that is on high and flies with its wings. the Lord of Crowns, Akhenaten, great in his lifetime. The above lines were written by the Pharaoh Akhenaten, originally crowned as Amenhotep IV before he changed his name. He was a Pharaoh of the XVIII Dynasty and the words were written in 1360 B.C. They are just several lines of the Great Hymn to the Aten carved on the walls of Akhenaten’s capital city at Amarna. The Great Hymn to the Aten is the longest form of one of a number of hymn-poems written to the creator god Aten and attributed to Akhenaten who radically changed traditional forms of Egyptian religion replacing them with Atenism. Egyptologist Toby Wilkinson said that “It has been called ‘one of the most significant and splendid pieces of poetry to survive from the pre-Homeric world. '” Egyptologist John Darnell asserts that the hymn was sung. Crowned as Amenhotep IV at Thebes, (present day Luxor) he changed his name to Akhenaten in the fifth year of his reign and began the abandonment of Egypt’s polytheist religion culminating in the building of a new capital city at Amarna. 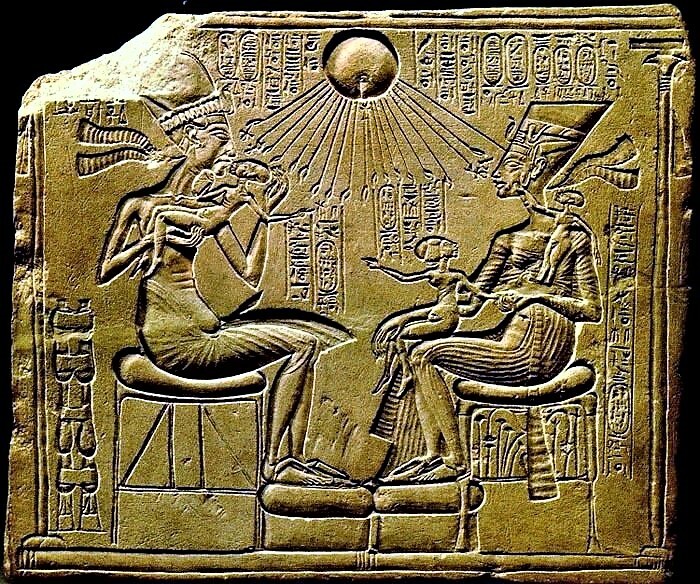 It was first thought that Akhenaten’s new religion was a form of sun worship but the readings and iconography soon revealed that Akhenaten did not believe the sun was god – he believed the sun was the only visible manifestation of god to man. Akhenaten soon forbade the open worship of the old gods, abandoned their temples, arrested their priests. His new temples to the Aten at Amarna had no roofs, no statues, no priests of Amun – open air to let in the light. It was a religion without darkness. Akhenaten issued a royal decree that the name Aten was no longer to be depicted by the hieroglyph of a solar disc emanating rays but instead had to be spelled out phonetically. Thus Akhenaten extended even further the heretical belief that Aten was not the disc or orb of the sun (the Egyptian sun god Ra) but a universal spiritual presence. Akhenaton’s religious reforms (later regarded heretical and reverted under his successor Tutankhamun) have been described by some scholars as the earliest known example of monotheistic thought. who silences him in stopping him crying. While it has been argued that there were monotheists among various Iron Age cultures, there is little doubt that Akhenaten was the first ruler of a major nation of the time to express a belief in monotheism and to impose it on his people -albeit briefly. Why did he do it? Did he believe or were there more practical political reasons involved as well? Akhenaten professed he was the son of god, of the same substance – “begotten, not made” as us cultural Catholics would say – the son, “who emerged from your body.” Did Jesus not profess essentially the same? On the other hand, he and only he could communicate with and understand god; he was god’s representative on earth. This appears to claim infallibility, a claim of many church leaders and prophets. Further, he established a virtual trinity – god, the pharaoh and his wife – “who lives and is rejuvenated forever and ever” -responsible for the people’s salvation of earth. The rather strange and eccentric portrayals of Akhenaten, with a sagging stomach, thick thighs, large breasts, and long, thin face — so different from the athletic norm in the portrayal of Pharaohs — have led certain Egyptologists to suppose that Akhenaten suffered some kind of genetic abnormality. Various illnesses have been put forward. On the basis of his long jaw and his feminine appearance. One theory was that he suffered from Marfan’s Syndrome which was later disproved with DNA analysis. Other eminent Egyptologists argue that the body-shape relates to some form of religious symbolism. Because the god Aten was referred to as “the mother and father of all humankind” it has been suggested that Akhenaten was made to look androgynous in artwork as a symbol of the androgyny of the god. This required “a symbolic gathering of all the attributes of the creator god into the physical body of the king himself”, which will “display on earth the Aten’s multiple life-giving functions”. Akhenaten did refer to himself as “The Unique One of Re”, and he may have used his control of artistic expression to distance himself from the common people, though such a radical departure from the idealized traditional representation of the image of the Pharaoh would be truly extraordinary. Others argue that the early deaths of XVIII Dynasty Pharaohs were likely a result of a Familial Temporal Epilepsy. This would account for the untimely death of Akhenaten, his abnormal endocrine body shape on sculptures and can also explain Akhenaten’s religious conviction due to this type of epilepsy’s association with intense spiritual visions and religiosity. There is no solid proof of this disease either although there was much in-breeding among Pharaonic blood lines. Akhenaten’s son, King Tut was born by one of his sisters. Professing monotheism, building a new capital away from the priests of Amun, banning the old gods and closing the old temples, banning the festivals, cut the people off from god. God would no longer hear them; god only heard Akhenaten. They must pray to him. Akhenaten also radically changed Egyptian art. Prior to his reign we saw the flat two dimensional depictions of men and gods. Here again there was a religious reason. The entire body had to be depicted in order that you have all of your parts in the after-life.Thus figures are flat, the body facing forward, all extremities illustrated including all ten fingers and ten toes. Akhenaten commissioned more human realistic depictions including family relations, as above sitting with his wife and three of his children. All of this was in direct contradiction to a thousand years of belief and culture and was bound to engender serious resistance. Sigmund Freud argued that Moses was a follower of Atenism, leaving Egypt after Akhenaten’s death to lead the Hebrews into the wilderness. Maybe the pharaoh was not the right man for the job. So do the modern monotheist religions borrow anything from Akhenaten? Psalm 104 sure bears a striking resemblance to the Great Hymn. How about the idea of a deity directing a group of people to a promised land, i.e. – the move from Thebes to Amarna? Son of god? Trinity? Within a few years after his death, Akhenaten’s religion was destroyed and erased and the old gods re-established. The old gods had been around for centuries – to believe Osiris had become irrelevant and to that to pray to Akhenaten and Nefertiti was sufficient wasn’t going to fly. “The Amarna episode elucidates one of the dangerous characteristics of monotheism, namely the “scape-goat”-effect, dogmatism and fanaticism. In the case of Akhenaten, Amun and Osiris were the scape-goats, his exclusive Aten worship with adjacent Pharaonic exclusivity, the dogma and the more or less systematic destruction and termination of cults & festivals; the effects of fanaticism and a lack of tolerance towards existing traditions. These themes are recurrent in Judaism, Christianity and Islam, each claiming an exclusive relationship with God. Ancient Egypt is a fascinating culture and time. I was overwhelmed by the country when I visited. Found you in my spam this morning Pete! You must be on the watch list over there!